The overall objective of our Wildlife Hazard Management Plan (WHMP) is to develop an integrated and adaptive program that manages risk at all of the Port’s airport facilities by reducing the probability of wildlife and aircraft collisions. A major milestone occurred in 1997 when we installed wildlife exclusion fencing around the PDX airfield perimeter. The fence has reduced the incursion of terrestrial wildlife onto the airfield to a manageable level. Avian species, however, remain a statistically higher risk for aircraft at PDX, especially during the critical phases of takeoff and landing. Consequently, the risk evaluation process of the WHMP focuses on avian wildlife. It is recognized that the risk of a bird strike at PDX can never be completely eliminated. PDX is located on the Pacific flyway and at the confluence of two major river systems, all of which serve as major movement corridors for migratory and resident bird species. The underlying premise of the WHMP is that it is possible to manage the risk to an acceptable level. The intent of the program is to provide the necessary direction to do so, in a scientifically sound manner, utilizing non-lethal means whenever possible. We are working internationally to share best-management practices that minimize harm to wildlife to support program development at other airports. Red-tailed hawks (Buteo jamaicensis) are common North American raptors. Because of their relative abundance, wide distribution and affinity for open areas, they are one of the raptor species most frequently encountered at airports. At PDX, red-tailed hawks occur as year-round residents, spring and fall migrants and wintering and transient birds. Active capture, banding and translocation from the airfield is one on-going method used to reduce the number of them and the incidence of strikes, particularly during spring and fall migration when non-resident red-tailed hawks are most numerous. An important component of our Raptor Translocation Program is knowing where the birds settle after they are released. We gather data by engaging the community through our PDX Raptors website. Participants log raptor sightings from around the region. 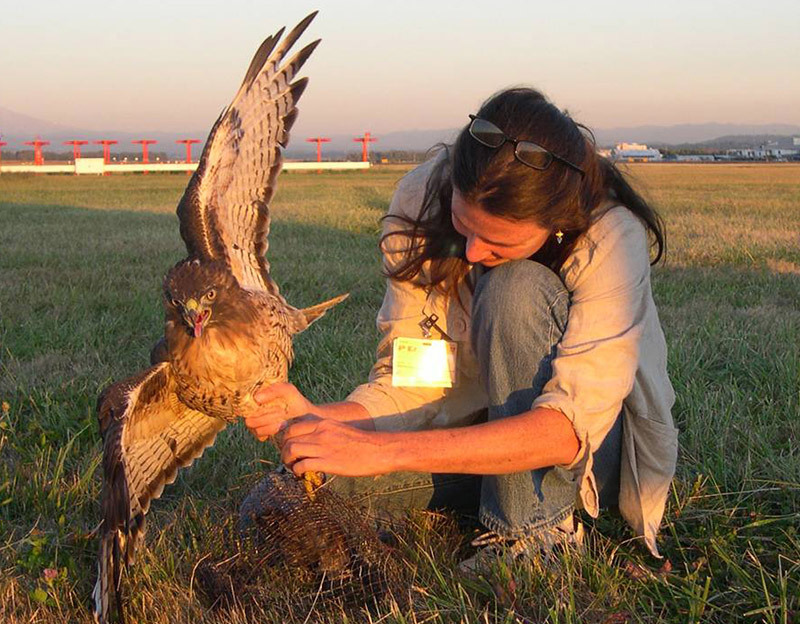 The citizen science data supports the selection of successful release sites to lower raptor return rates to PDX. Engaging the birding community is an important element to our success and protects birds, keeping them away from the dangerous airfield environment. We have captured and released approximately 1,600 red-tailed hawks since 1999. While not as frequent, the program manages other raptor species as well, such as American kestrels. In total, we have translocated thirteen different species and 2,530 individual raptors between 1999 and 2016. For more information, visit our Raptor Translocation Program website. 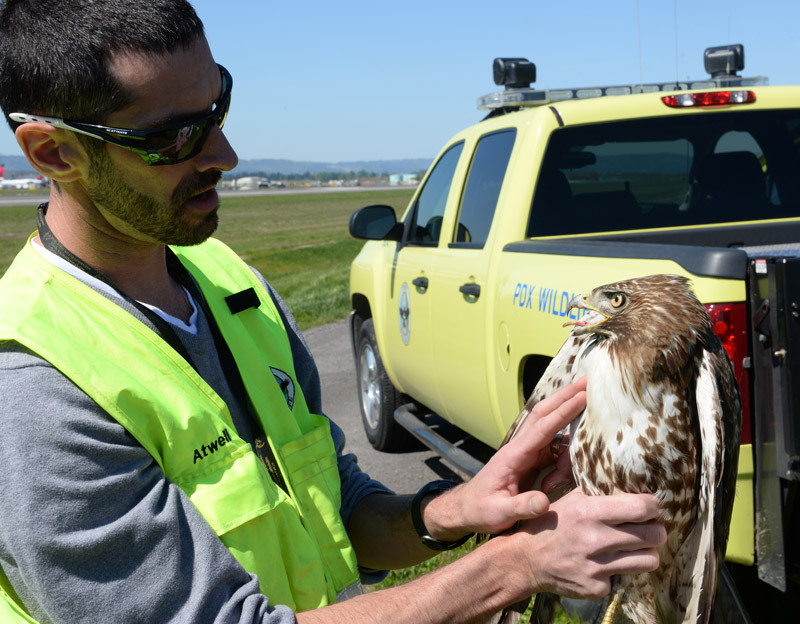 We've taken a collaborative approach to building and designing the PDX Wildlife Hazard Management Program through the PDX Aviation Wildlife Advisory Committee. The committee provides feedback on our program and an opportunity to coordinate on mitigating wildlife hazards. An educational partnership provides a hands-on internship opportunity to Mt. Hood Community College students. We monitor birds on our properties in accordance with the International Migratory Bird Treaty Act and the Bald and Golden Eagle Protection Act in cooperation with the US Fish and Wildlife Service. Additionally, we delay or sequence work scheduling on construction projects to avoid impacts to active nests.